Aprilaire 400 Humidifier â€“ Lowest price, Free Shipping! The Aprilaire 400 bypass humidifier can humidify a tightly-constructed home of up to 4,000 square feet. 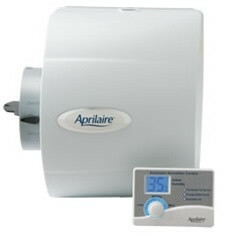 The Aprilaire 400 Humidifier features a unique water-conserving design that does not require a drain line. The digital humidistat automatically adjusts the humidity level as outside temperatures change. Add the Aprilaire 4788 Annual Maintenance Kit to your order! This convenient kit gives you all the parts you need to maintain your Aprilaire 400M humidifier each year and keep it running in like-new factory condition. This humidifier includes a built-in bypass damper that is conveniently labeled for winter and summer settings. The Aprilaire 400 comes complete with the new #60 Aprilaire digital humidity control, one Aprilaire water panel, outdoor temperature sensor, saddle valve, 24V transformer, and installation instructions from Aprilaire! We Donate a portion of every PhilanthroTM Purchase to help orphans around the world.